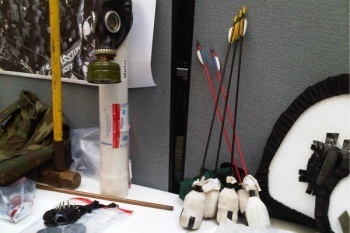 Police in Toronto confiscated a wide range of weaponry from G20 protesters over the weekend, including machetes, clubs, bear spray - and medieval fantasy gear belonging to one poor guy who was on his way to a LARP event in a nearby park. It was a rough weekend to be in Toronto. The G20 was in town, which meant that showdowns between police and so-called "protesters" were inevitable. Sure enough, windows were smashed, fires were started, skulls were cracked and weapons were confiscated, some of which were later put on display for the press in order to demonstrate the extent of the danger faced by police. Unfortunately, that plan backfired a bit. While most of the stuff was obviously dangerous, things got a bit awkward when Chief Bill Blair pointed out a number of arrows with tips covered in padding and socks, which he said were meant to be dipped in flammable liquid, set alight and, one would assume, fired at police. According to landscaper Brian Barrett, however, the arrows belonged to him and were part of his "live action role-playing" get-up that was seized by police while he was on his way to an event in Centennial Park. Along with the arrows, police also displayed Barrett's scale mail armor, foam shields and padded clubs. Barrett said he was "appalled" to see that police had laid a machete across his armor, although whether that was because of the implied connection between the two or the fact that they were mussing up his fine scale shirt wasn't made clear. He did say, however, that he was worried people who see him in the future might think, "Oh my god, that's one of the terrorists from G20." Also on display were gas masks, spray paint, a replica gun, saws, knives, a slingshot, chains and handcuffs, along with other not-necessarily-dangerous gear like bandannas, bicycle and skateboard helmets, golf balls and goggles. The Toronto Police are facing a growing wave of criticism over its handling of protests during the G20 summit, which saw significant levels of property damage, four destroyed police cars and more than 900 arrests.